Making strawberry yogurt is easy, just beat the mixture of freshly cooked strawberry and sugar or homemade strawberry jam (or freezer jam) with plain yogurt and voila. Making strawberry yogurt is easy, just beat the mixture of freshly cooked strawberry and sugar or homemade strawberry jam (or freezer jam) with plain yogurt and voila! Best flavored yogurt is ready. This recipe is one of the many ways to enjoy the fresh and delicious strawberries during its annual season and it involves only little cooking and also preserves the all vitamins and carbohydrates of it. Step 1: If you are using homemade or readymade jam then skip the steps 1 to 4 given below. If you do not have the strawberry jam then follow the given steps to make it at home. Step 2: Wash and drain strawberries. Finely chop into small pieces. Add finely chopped strawberries and sugar in a small non-reactive pan and heat it over low flame. Step 3: The sugar will start to melt within few minutes. When the sugar is dissolved completely, increase the flame to medium. Stir in between occasionally. Step 4: Cook until mixture turns thick, it will take approx. 8-10 minutes. Stir in between occasionally to prevent sticking. Step 5: Turn off the flame and transfer the mixture to a small bowl. Let it cool at the room temperature and then place it in the refrigerator for at least an hour to chill it. The strawberry jam mixture is ready. Step 6: If you are using greek yogurt or hung curd, skip the steps 7 and 8. Step 7: If you are using plain normal yogurt (or homemade curd), follow the given method to prepare thick yogurt (hung curd) from it. 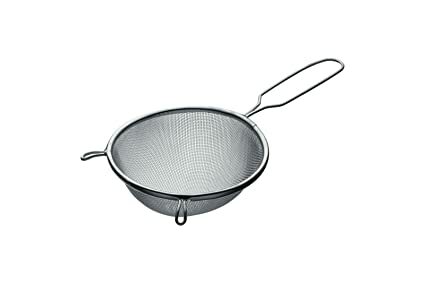 Place a large metal sieve or a double layered cheesecloth over a large bowl. Place the yogurt over it and keep for at least an hour (or 2 to 3 hours, if possible) to drain the excess liquid from it. To prevent the yogurt from turning sour, keep them in a refrigerator. Step 8: After an hour, transfer the yogurt to a large bowl and discard the drained liquid. Step 9: As you can see in the photo, the yogurt looks thick. Step 10: Add cooked strawberry mixture or 2½ tablespoons strawberry jam. If you are using readymade strawberry jam, adjust the amount of it according to its sweetness. Step 11: Mix well and transfer it to individual serving bowls (or keep it in the same bowl). Place it in a refrigerator for 1-2 hours. Chilled strawberry yogurt is ready for serving.